Robert Walker, troubled star of Strangers On A Train, died of a lethal interaction of alcohol and amobarbital, aged 32. 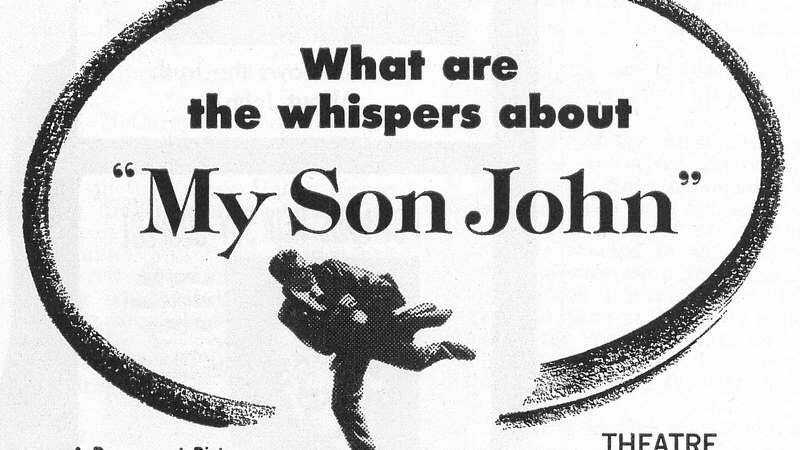 At the time, Walker was working on a movie called My Son John, perhaps the most notorious of the early ’50s Red Scare movies—notorious not only because of Walker’s death partway through production, but also because it happens to be the only genuinely affecting entry in a historically disreputable sub-genre. It’s an anti-Communist film premised entirely on emotional appeal. Admittedly, picking McCarthyist paranoia for this week’s theme might seem indecent, given that the Red Scare is widely considered to be Hollywood’s darkest period, marked by opportunism, factionalism, and betrayal. Careers were destroyed. Two years before the release of My Son John, writer-director Leo McCarey had been part of the secret block assembled to oust Joseph L. Mankiewicz from the presidency of the Directors Guild Of America for refusing to support a blacklist. Frank Capra was part of that block as well. McCarey—a Watch This regular—was a sensitive director with a superb feel for the subtleties of performance, a quality that made him great at both comedy and gut-wrenching drama. He was also very conservative and a devout Catholic, especially later in his career. My Son John is essentially irrational; it’s a movie about an older couple (Helen Hayes and Dean Jagger, both very good) who begin to suspect that their eldest son (Walker) is a Communist. There’s nothing seriously ideological about McCarey’s Red-baiting; for him, Communism is a kind of Oedipal urge that destroys from within. It is a locus of domestic fears, rather than geopolitical ones—of parents fearing that they don’t know their children. It works, because McCarey builds My Son John—which, at over two hours, is long by the standards of the early 1950s—around a sense of familial intimacy, which is then betrayed. It is a strange and often moving film, at once demented (especially in the patched-together final act) and full of grace notes. It imagines America—or, rather, McCarey’s conservative view of America—as something as primal as family, which cannot be forsaken. Red Scare flicks were typically cynical schlock. This one believes every word of what it says. Availability: My Son John is available on Blu-Ray from Netflix or your local video store/library. It can also be streamed through Amazon Prime.